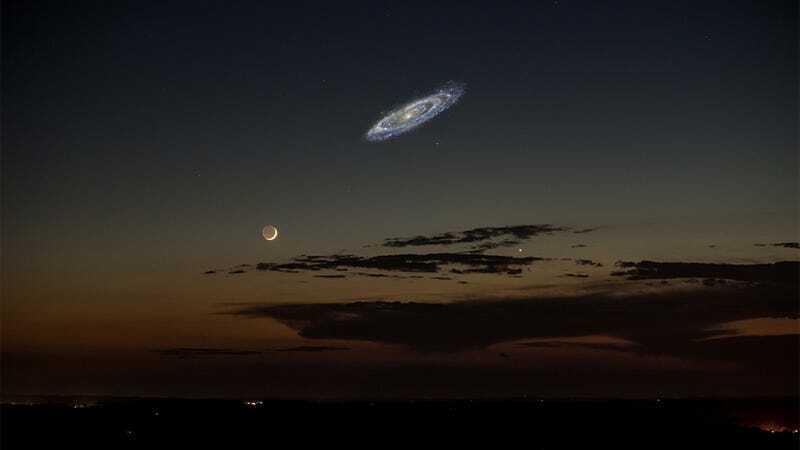 This is how the Great Spiral Galaxy of Andromeda would look in the sky if it were bright enough. Sadly, its light is too faint. But imagine seeing that every night. Would you get tired of it? I know I wouldn't. Andromeda—or M31—is larger than our Milky Way (although not as massive, if you count the dark matter in our galaxy.) It's 2.5 million light-years from us, while the Moon is only 384,400 kilometers away. Now think that a light-year is 9.5 trillion kilometers. Even with this graphic comparison, the size of M31—or anything at a galactic scale—is truly incomprehensible for the human mind. But there's nothing to fear: the stars within the Milky Way and Andromeda are so far apart between each other than the possibility of them colliding is almost nil. And you will not be around anyway, so who cares. Just enjoy the videos and imagine the show. Note to Galactus: the sky really needs Photoshop's Shadows and Highlights filter. The original image used for the composite was taken by Stephen Rahn.